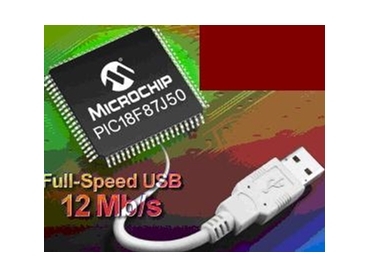 Microchip Technology, a provider of microcontroller and analogue semiconductors, has released eight-member PIC18F87J50 high-performance, cost-effective 8-bit microcontroller family with an integrated and certified USB 2.0 Full-Speed, 12 Mbps transceiver. This new USB microcontroller family also provides 12 MIPS performance with ample I/O and a rich selection of analogue and digital peripherals for embedded systems designers who require Full-Speed USB connectivity. Unlike competitors’ products that can only serve as an interface between a serial port and the USB bus, the PIC18F87J50 family can perform as the sole controller in embedded applications. The majority of USB-capable microcontrollers are optimised for applications in the personal computing (PC) peripherals and consumer markets, leaving a real void for embedded engineers. Microchip’s new USB PIC microcontroller family makes the benefits of Full-Speed USB available to a broader range of embedded applications that operate in harsh environments and only occasionally connect to personal computers or other USB hosts. The particular requirements of the embedded market are addressed by integrating USB as one of the primary serial interfaces, as opposed to the prevalent approach that adds a serial-to-USB patch on top of an existing design. The PIC18F87J50 family from Avnet also includes nanoWatt Technology for low power consumption in sleep mode, which is ideal for battery-powered applications. These features, combined with up to 65 available I/O, 128 Kbytes of Flash program memory that can be updated in circuit and a rich peripheral set, including a 12-channel, 10-bit Analogue-to-Digital Converter (ADC) and a Parallel Master Port for connection to external memory and displays, make this USB microcontroller family ideally suited for embedded-control applications.